My main hobby is sausage making, but I get asked all the time how to make beef jerky. That makes sense when you stop and think about it. Making good jerky takes many of the same skills as making good sausage. It also uses much of the same equipment that sausage makers already have on hand. Knowing how to make beef jerky is a great compliment to your sausage skills. The really nice thing about making jerky though, is that you can turn out a great product even if you don't have a lot of specialized gear. Jerky is really nothing more than meat that has had most of its moisture removed by being exposed to very low and dry heat (around 100 degrees F.). It is "dried", not cooked. ...is made by taking the meat that you are going to use and cutting it into thin strips (usually "with" the grain of the muscle). This produces the familiar chewy "frontier style" jerky. Whole muscle jerky is probably the easiest style to make, as all you really need to turn out a good product is a supply of meat, a knife, and a means of drying the meat strips. ...is produced by grinding very lean cuts of meat, shaping the meat into thin sheets or strips, and processing them by drying. This makes a more tender "homogenous" style of jerky, and can be very good indeed. I do recommend that you learn how to make beef jerky in this manner. Making ground jerky is a very good choice when you have lots of smaller scraps of meat that wouldn't be suitable for the whole muscle process. I've made a lot of ground venison jerky with the smaller lean cuts and bits that are left after processing a deer into chops and roasts. No matter what style jerky you make, you'll need a way to reliably dry it into the finished product. There are four methods you can consider. This is the way that jerky was originally made, and can and will still work. You rely on the sun to provide the heat and air movement around the meat. If you live in an area with lots of good sunlight, high enough temperatures, and low humidity this method may be an option for you, but I find it to have built in problems. You can't control drying temperatures very well. It can take several days (or longer). You have to bring your jerky inside (or otherwise protect it) at night so humidity doesn't undo your progress. Even though it would be fun to learn how to make beef jerky this old fashioned way, I think there are better methods. These work very well, and can certainly be considered. Most commercial dehydrators even come with instructions on how to use them to dry jerky. Most have a fairly limited capacity (they're small). 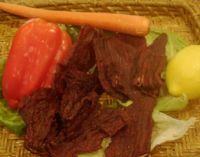 If you don't already own one, a dehydrator can be a fairly expensive piece of equipment to buy, just to learn how to make beef jerky. The majority of us already have at least one of the next two ways to dry our jerky ready at hand. A regular kitchen oven can do a good job of drying a large batch of jerky in fairly short order. Place the jerky strips into the oven, either directly on the oven racks or on screens or other racks you have made for that purpose. Be sure there is space left around each of the strips. Put a pan or some aluminum foil onto the floor of the oven to catch any potential drips (there are bound to be some. Turn the oven temperature as low as it will go, and prop the door partially open to allow moisture to escape (I use a chunk of broomstick). Let the jerky dry until it bends but doesn't break. You don't want to over do it. That brings up one of the two potential drawbacks I see with using the oven for jerky. Most ovens really don't produce low enough temperatures to "dry" rather than "cook", so you have to keep a close eye on your jerky. My favorite place to make jerky is in my meat smoker. It has a large capacity, a drip pan for any wayward juices, good ventilation to allow moisture to escape and, most importantly, it will let me dry at temperatures as low as 100 degrees F.
When I use the smoker I also have the ability to add smoke flavor to the jerky without using liquid smoke. I can fine tune the smokiness to suit my tastes. ...You will still have the use of your oven for making meals and any odors from the jerky making process are kept out of the house. Now that you have the basics on how to make beef jerky (or venison jerky, chicken jerky, bear jerky, etc. ) here are some specific recipes to get you started.